Scooters, Electric Power Scooters, 3 Wheeled Scooters, 4 Wheeled Scooters and Scooter Accessories. Scroll down to see our selection of Electric Scooters for sale. Scooters are used by individuals with limited mobility to get from one place or another. We carry Drive and Invacare brand scooters. Our 3 and 4 wheeled scooters are light and break down for easy transport. The right scooter can help make the long road pass by quicker. Scooters are a mobility aid equivalent to a wheelchair but configured like motor scooter. 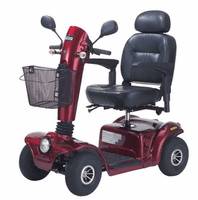 It is often referred to as a power-operated vehicle/scooter or electric scooter as well. Scooters typically have a seat over 3 to 4 wheels, a flat surface or foot plate and handlebars. Small assistive sit-down scooters provide advantages to individuals with mobility problems throughout the world. With operation as simple as a push of a button, scooters give the disabled or elderly to travel longer distances in a shorter period of time. Making a trip to the grocery or department story an enjoyable task..